We've all seen the videos (and some even got access to a developer's preview) of Google's latest product - Wave. Although not "ground-braking" and "revolutionary" as we've imagined (wonder why "over-hyped" comes to mind) it still features some great UI that will surely inspire at least a few developers to implement some of it in their works. I, being one of those inspired people, am going to show you how to create a Google Wave-like history slider. Using it, we will enable our visitors to go back and forth in time to view the changes that take place on a comment thread. So take a look at the demo (maybe even keep it open in a separate tab), download the example files and keep on reading. The technologies we are using include PHP as a back-end, MySQL as data storage, jQuery, CSS and XHTML for the front-end with AJAX in between. The slider itself is a component created with jQuery UI. This is pretty much all the layout we are using. The main reason why the code is so short is that we are using CSS to style it, and that the outputting of the comments is handled by a special PHP function, both of which will be explained in a minute. The great thing about jQuery is that, thanks to Google's CDN, you can directly include it in your site, without having to worry about downloading and storing it on your server. This also aids your page loading time. The same is true for jQuery UI, which contains our slider. Not only that, but the CDN also holds the styling and images needed to display it properly. connect.php - handles the DB connection. We'll be looking only at the first three files here. // Removing comments that are older than an hour. The comments are ether parents (they are added directly to the thread) or children (added as a reply to a parent). Only two levels of ancestry are allowed (meaning that replies are disabled for the children). 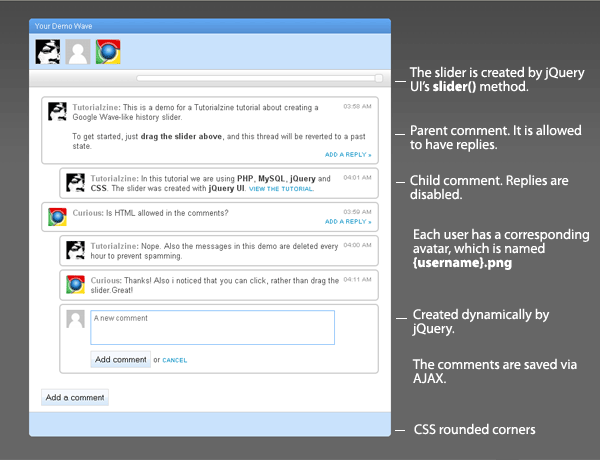 The comments are later outputted by the showComment function (you can see it in the XHTML step above). // You can integrate it to any site and show a different username. The last step is the trickiest one - in this case the jQuery code. As you remember, we generated a special PHP string, which holds calls to the addHistory function. Each time it runs, it increments the totHistory counter. After all the comments are loaded the $(document).ready runs and the slider is initialized with totHistory as the maximum value of the slider. The minimum value is 1, because we want to have at least one comment visible. Now lets take a look at the second part of the file. on the bottom of the page, and the add a reply link. The functions in this part of the code handle the comment submission via AJAX to the PHP back-end. I believe that further clarification is needed for the success function in the AJAX. As you know, it is called when we have successfully executed the AJAX request (in this case it is called if the comment was written to the MySQL database). Inside this function we check whether a proper insert ID is returned, which corresponds to the internal MySQL id that was given to the auto-increment field (see below for the MySQL part or take a look at table.sql in the example files). If everything is OK, we call the addHistory function with the new data and update the maximum value of the slider. This ensures that the newly-added comment is history-scrollable with the rest of them. This step is only required if you want to run the demo on your own server. If you run into problems, read through the comments below or write a new one if your problem is not addressed there. With this our Google Wave-like History Slider is complete! You are free to modify the code of this example and use it in your own sites. Also it would be great if you share what you've done with the community, via our newly added feature - Tutorial Mashups (you can find it below every tutorial). This would be a nice feature to have in a blog for comments. I wonder how hard it would be to make a plugin to do this? ohh man your killing me, i cant wait got my invite. wow! Now this is what you call an innovative tutorial, that's pretty sleek mate! Will be using this some how on my next project! It's great to see Google Wave exploding into popularity like it is now. I can't wait until it's really open for public use, it's going to really shake how businesses collaborate and work. If i use the js/css with a language other than php, but that outputs the same content as the php, will it work? Nice... now I just need an invite. Sliders are one of the worst UI controls, specially without snap points. Please dont turn sliders into a trend again on web UI, there are so many better solutions. Great tutorial. I've never seen anything like it. Keep pumping out the great content! @Henrique This is a pretty slick design improvement and might "cure" some of the shortfalls you see in this UI control's overall use. I might suggest adding a pop-up date to show the user where they are in the history which fades away when their mouse moves away from the slider. What would you suggest as an alternative to a slide to accomplish the same functionality, by the way? My hesitation is that the user will be constantly forced to scroll to a point in the history, down to where they would like to see, then back up to adjust the slider. Something to maybe float the slider as you scroll down and lock the page to a comment when you slide the scroll bar would help to alleviate this issue. Great post in general and especially for those of us who have not been able to get our hands on Wave. That's a nice demo, with a great in-depth explanation. Thanks! A nice upgrade to the demo would be to have the window scroll to the comment as it is shown/hidden, while keeping the slider static on the screen. It would also be great to see a similar concept packaged as a Wordpress plugin. However I'll leave it to you guys to figure it out - you can modify and use the code any way you see fit. this is really nice tutorial.i must use it in my project. This is so excellent. And if someone makes a Wordpress plugin from it, I'll be able to die happy. Seriously, this is exactly the kind of thing I had in mind for my WP blog comments. Just don't get it why ..
Got it working with wordpress comments :) Thanks guys.. if you did like to have a look http://designerfoo.com/custom-wordpress-development#contentstartshere -> Planning to put the slider to good use :) let me know what you think! This is a very nice tuto. Thanks to the authors. You won't have the "Undefined index" notice, and it should work. I'd like to know if developments are planned to add a user connection interface (to have others than "Demo") and if Comment could have more properties ? Whatever, thanks a lot, that a very good stuff... Let us know newt steps ! Thanks for the comment. On the PHP side (before writing to the database) strip_tags is used, which removes any scripts and leaves only plain text behind it. The problem you describe, arises from the fact that in the front-end, after you hit the submit button, the string you've filled is shown unmodified as your comment (to save a MySQL select). This means that the only person a hacker could possibly XSS attack is himself. However, if you plan to use this in a production environment it would be best to fix it. Exactly, so in the front and not in the end as I mentioned. Using regular expressions as you say the problem is solved. Just mention it in case someone uses it in a production environment. i dont understand this how can i make this script without demo ? i have test it but when i make a comment i am user "demo" and when i refresh the site the comment go away . what must i do or change ? if i comment the line: / require 'connect.php'; / in demo.php I can see the page but my comments don't get stored in the DB. SO .... Do You can help me???? Notice: Undefined index: replies in functions.php on line 29. What i was about to do is to use it as comments for albums, I use $alId = $_GET['alId']; variable which is passed when selecting an album. How can I pass this variable to saveComment.php file that album ID would be inserted into mySQL table with other data? This is great. nice one. Nevermind my problem is now solved. I put the content of demo.js inside script tag on demo.php :) And now the PHP is parsed! Hi. Is it possible to have readers login before they can make a comment with this Google wave? Anyone know how I could add a name field to the comment? Right above the Comment field, they have the option to ad their name. This is so cool, I am going to implement in my latest design. You know what I have done some checking I have noticed one way how to make this awesome unsurpass-able... The replies to the comments could also get a possibility to be answered to! But I think that I will be doing this on my own. Hi Martin!, I have a problem, I want to order de Comments DESC but when i do it the reply dissapear, How can I solve it? I want the new post be on top and reply ordered ASC, maybe some facebook style.